Story & World. Time travel is a concept that I find fascinating and that I’m drawn to time and again, though I find thinking on it too hard makes my brain hurt – alterations to the time line, paradoxes and the completely over-my-head theories. Though McEntire does a fairly good job of keeping the technical aspect of time travel simple, there were still aspects of this story that I had some trouble wrapping my head around. There were also many elements of this story that felt pieced together from other things I’ve read or seen – just vibes that reminded me strongly of other stories. These things didn’t make it unenjoyable, one just hopes for a little more originality, I suppose. Emerson. McEntire’s character development, particularly in regard to Emerson, is fantastic. So many protagonists today have that snarky, sarcastic gene. A generous amount of sass is practically a requirement for any leading lady, yet while Emerson is all of these things she adds something far more uncommon – a dynamite sense of humor. Emerson doesn’t employ any kind of verbal filter, and as a result her sharp comebacks and quick quips are often extremely witty, pointed and hilarious. Another thing I really appreciate about her character is what a volatile balance of confidence, decisiveness, and toughness she is, while also being fragile, vulnerable, and uncertain. The Boy Toys. While I found Michael tantalizingly intriguing at first, he became somewhat one-dimensional as the story progressed. Kaleb, on the other hand… Now HE is all kinds of long-term intriguing and appealingly broken. “Baby, just say yes.” Ok… let’s talk about connection. The romance in Hourglass was a bit… strange? I’m a little over the “instant connection” thing, the “I can’t be with you for reasons you’re not allowed to know about” thing, and the love triangle-ish thing was a little… sudden? Weird? Something. I just can’t help but wonder, when your ability to choose is stripped from you by some kind of super-human, chemical reaction, is it really “like”… or “love”… or something in between? Barring all sci-fi weirdness, would there have been a different outcome? There are at least two more books. Perhaps this will be addressed later on? Overall. 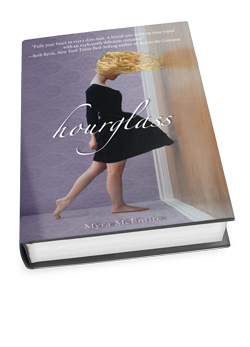 Though Hourglass didn’t blow me away like I’d hoped, ultimately I’m still drawn to the whole time travel concept McEntire’s created and to Emerson, and I’m extremely curious as to where she’s is going to take the story next. I’ve ne’er been a HUGE fan of time travel books, but I’ve seriously had this one on my shelf for like a year just WAITING for me to feel in the mood for it!! What is this “ne’er” situation?? Apparently autocorrect made me a historical romance heroine in your comment section! Yeah, I think it’s harder to make a time travel story… credible? Is that the word I’m looking for? I think sometimes TT stories take a little more suspension of disbelief? Or maybe I’m just not smart enough to really understand them. < – Entirely possible and most likely probable. But my copy was on my shelf for about a year too, and it’s worth a go! Emerson is a pretty cool heroine. Oh how I LOVED this book and ADORED book 2! WOW! I’m SO excited that she just finished book 3! WOOT! WOOT! Great review, Dani! I think this cover is fantastic but some of the overused tropes I can do without. Maybe I’ll try this someday?